Litchi with hints of grapefruit and banana? Violets, roses and fresh cut grass? These are just a few of the words that might be employed when describing the aromas found in wines, but if you’re like I used to be, you might wonder – come on? Litchis? How did they get those litchi smells in there? I used to think that the explanation could only be A. there were some very creative wine writers out there or B. that these smells must come from the environment where the grapes grow, but then how can a wine from Galicia smell like passion fruit? Where do the aromas in wine come from? 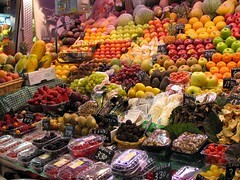 Primary Aromas: Come from the fruit. They are the fruity or floral smells that come from terpenes which are a variety of hydrocarbons, found in essential oils and plants. Tertiary Aromas: Come from the aging, both in wood and in bottles. They might be vanillas, coconuts, spices, tobacco, menthols etc. from the wood, and/or leathery, animal, reduction smells from the bottle. Within these categories, there is an infinite number of different aromas produced by the infinite number of different volatile substances found in wine. Depending on the wine-maker and the way that the wine is made, some of these aromas can be manipulated to produce the desired results. The wonderful thing about wine is that as it is so subjective, one person might really go for wines with thick smoky aromas, while someone else might prefer the fresh fruity strawberry notes found in other wines. And of course, there are certain aromas that are usually considered “defects” in wines, sometimes brought upon by bacterial invasions or adverse conditions that wine-makers steer clear of. On a recent visit to the renowned winery Abadia Retuerta, and under the guidance of enologist and wine-making deity Angel Anocibar Beloqui, I was lucky enough to have a first-hand look (or smell) of 9 of the most common chemical compounds that produce aromas in wines, some but not all of them commonly considered to be defects. I should note that I smelled these substances, not in the wines, but in their pure form. Wines will always have small amounts of these substances, but in these small quantities, they are virtually undetectable and are only considered defects when they occur in larger amounts. Dimethyl Sulphide (DMS). I was told that this substance is very commonly found in Australian wines and it gives them that raspberry liqueur smell that they sometimes have. In its pure form, it smells like Korean Kimchi, canned clams and Brussel sprouts. Ethyl Acetate. Very common to wines from Priorato, and generally considered a defect. Smells like rubber cement and nail polish remover. Ethyl-4-Phenol, Brettanomyces. Not necessarily considered a defect but very persistent taste-wise. Stable, new leather, horse sweat, etc. Whenever you smell a wine and think, “this smells like barn” well, now you know. Isomyl Acetate. Smells like artificial banana or painting workshop. From fermentation, it is common to all wines. Ethyl Octanoate. Common in white wines. When they lose the banana smells they are left with these aromas of cherry, strawberry, anise, cheese. Whiskey Lactones. Coconut sun tan lotion, Hawaiian Tropic. Comes from American Oak barrels. Isoeugenol. Smells exactly like carnations (the flower), cloves, lily of the valley. It comes from the way that the wood of the barrels is toasted. Trichloranisole or TCA. Universally considered a defect, it means that a wine is corked (contaminated by the cork) and likely smells musty, dank and rather like wet cardboard. Terpene mixture, frequently found in Moscatel wines, and in its very concentrated form smelling of baby wipes. After smelling, and sometimes tasting these substances, Angel suggested that we start adding water in small amounts to determine how diluted they would have to be for us to NOT notice them. DMS, for example, kept its aromas even after being greatly diluted, but it was interesting to note that the clammy, Brussel sprout aromas became more and more pleasant smelling as they were made less strong – enough so that I could even imagine them as being agreeable components to the general aromatic makeup of a wine. While these are just a few of the many components found in wine, they offer a good explanation of “how did all that stuff get in the bottle”, and more evidence as to the incredible and inherent complexity that exists within the continually evolving and delightful adventure that is wine.